Now not knowing more than a smattering of french words, I should probably leave it at that, but due to the fact that in recent times it seems I’ve come over all ‘frenchy‘, I will probably see if I can slip just a little more french words into this post. 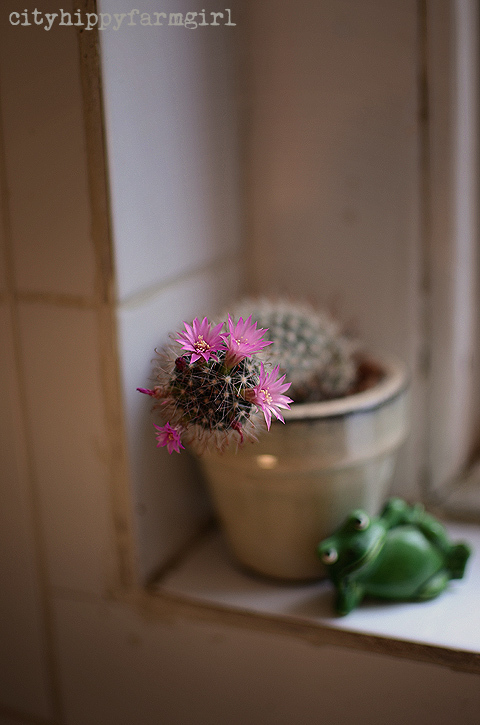 Petite fleurs, teeny tiny ones that didn’t last long on my usually quite unexciting kitchen bench cactus. Gateau a la banane with passionfruit icing. Always a simple bake when there are squishy bananas to be had. I make this cake up in a mixer these days. Parisian flea market finds, bought and brought back for me. I was particularly excited by this one. How many kitchens has this round beauty seen… What had it been used for? 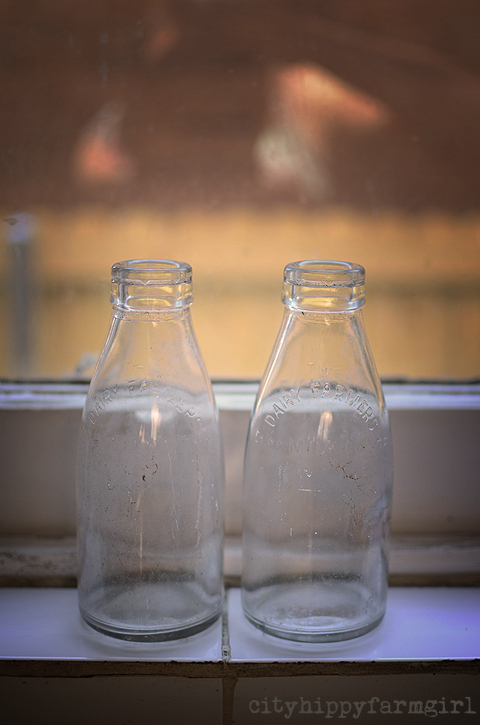 Old milk bottle finds that were sitting unloved in someones garage. I’m preparing the bottles to be loved again…or should I say amour. Kisses on both cheeks to anyone who leaves comments in French this week. This entry was posted in Food Glorious Food, Rambles, Waffles and Digressions and tagged banana cake, chestnut spread, France, in my kitchen, my petite kitchen, passionfruit icing by cityhippyfarmgirl. Bookmark the permalink. I love this! I took French in high school and college, but fear I’m down to a similar smattering of French vocabulary. I feel as though kitchens were just meant to be Frenchy. Someday, when my kitchen is a little bigger, I think I need a poster with Julia Child quotes! bisou bisou mon cherie et pour vos beaux enfants!!!! Mangez bien, riez souvent, aimez beaucoup. Your blog always encompasses the best of family life. Mon cher avez-vous lu chocolat et courgette? Bien qu’il soit Clotilde français écrit en anglais et c’est un délicieux blog. Chocolat et Zucchini est un blog fabuleux! Oooh a whole jar eh? What to do indeed… I remember seeing a cake somewhere in the blogosphere which looked amazing. My little tube though, not sure. Bonjour Brydie! J’adore toutes les choses françaises aussi! Je n’ai jamais goûté à la pâte de marrons et je serais curieux de savoir ce qu’il goûte. J’espère que vous apprécierez ce que vous créez avec elle! À bientôt mon amie! Lovely. See without google translate I have no idea what you just said, but of course it would be lovely, it’s in french! Thank you dear Keri, two kisses on both cheeks for you. Très bon indeed Johanna. I couldn’t take it any longer and had to try it… sweet! I know it’s probably wrong, but today I was thinking it wouldn’t go astray atop of a sao or two…not so chic huh. Too cute, all of them. How wonderful is that round copper (?) pot thingy, even better that it was from a French flea market. Did you watch The Little Paris Kitchen on SBS recently? I loved it! I was a bit slow with that series, I think I only caught one episode regretfully. The copper thingy I think, is a colander…not sure what I’ll do with it yet. I think you could possibly still catch on SBS on demand which is how I watched all the episodes. Otherwise I find lots of things end up on You Tube – Jamie’s fifteen minute meals were all on there. 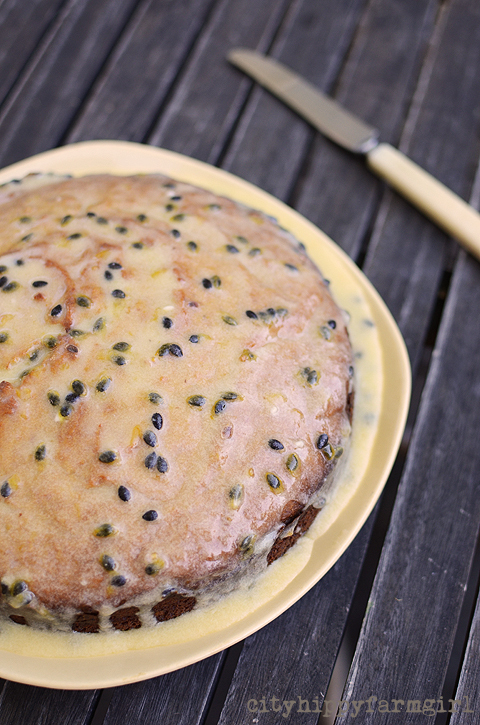 Your Gateau a la banane with passionfruit icing looks beautiful, true! Love chestnut spread and your Petite fleurs brightened my day too! Yep – that passionfruit icing looks divine. What is that tray with holes? Could it be something to bake bread or a tart on to crisp the bottom? No French from me I’m afraid – never studied it. I think it’s a colander of a sort. It’s pretty big…flour sifter? Hmmm, if only it could talk! What a fun post, thanks for giving a tour ma cherie! Je vais à Paris dans une quinzaine de jours. Dites-moi si vous voulez un peu plus de pâte de marrons. Oh how do I say you lucky, lucky bugger in french! Enjoy every second of it Richard. Please sit in a tiny Parisian cafe and knock back a coffee (or two) for me, breathing in the scene. Have a wonderful trip! Three kisses for that Mariana! Hahahahaha……….You know what’s really funny – the Balkan way is actually Three Kisses – how ever did you know??? Brydie, my French vocabulary consists of “French fries” and “French toast” 😉 — but your IMK post appealed to “moi” greatly. 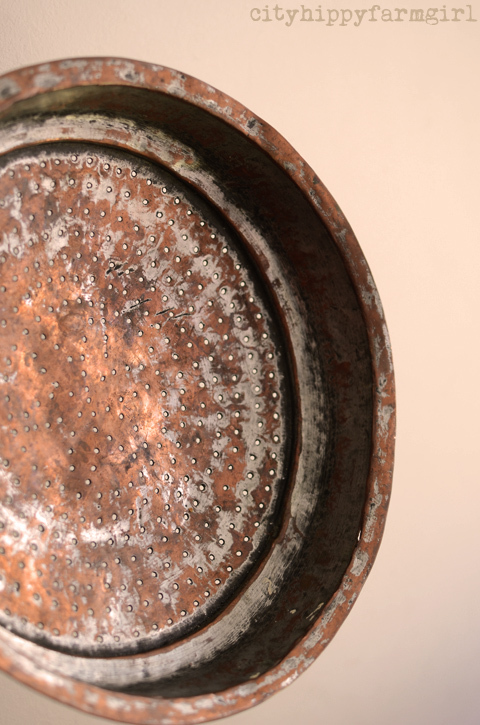 The history (and mystery) behind your copper-colored baking pan is a treasure, as are your milk bottles waiting to be loved again. Curious to see what you come up with for the chestnut spread! Yes, what to do with that chestnut spread indeed. I do enjoy having things in my kitchen with a history and a story to go with them…bought in ikea isn’t quite the same. bisou à toi – bravo! bis! encore! Parisian flea market finds? You are one very lucky lady Brydie. 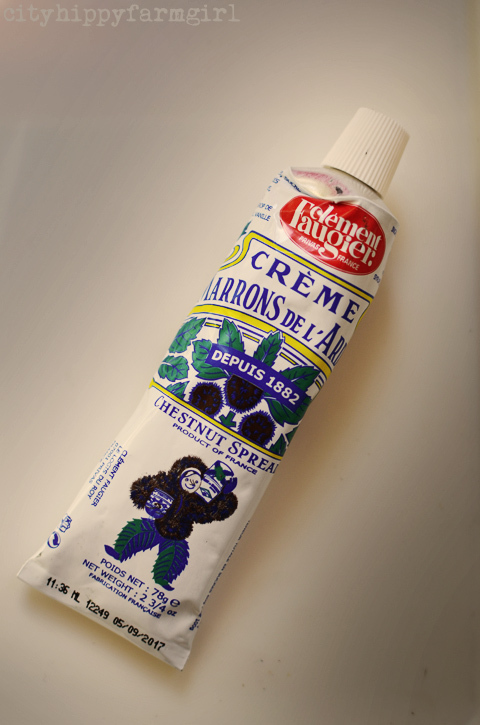 Love the chestnut paste packaging, especially Mr Chestnut! Can’t wait to see what you make with it (I notice it has a seriously long use-by date, so I guess there’s no hurry)! PS. Banana gateau with passionfruit icing has my name written all over it. I’d like a slice right now thanks. I hadn’t even noticed the use by date…ohhh that is long!! A lovely look at your French finds – and I especially loved the cheeky frog. Merci!